Although Lantana are half hardy perennials they are normally grown as half hardy annuals in the garden. They carry clustered flowers of yellow, red, orange, lilac, white, or pink from the middle of summer until the first frost of winter. Lantana reach from between 30 to 60 cm (12 to 24 inches) in height. 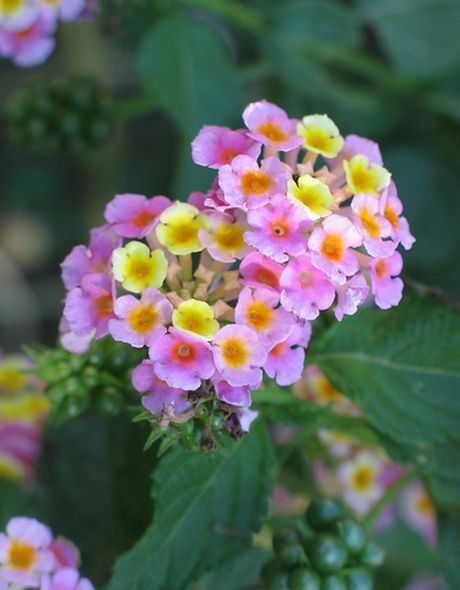 Some of the common names for Lantana include Yellow Sage, Shrub Verbana, and Red sage. Lantana flowers by Nieve44/La Luz. Common Names: Shrub Verbana, Ham 'n' Eggs. Spanish Flag. Button Sage, Red Sage. Lantana: Weeping; Desert; Brushland; Island; Trailing. Native: Tropical regions of Africa and the Americas. Flower Details: White, yellow, blue, pink, orange. Multi-coloured. Changes colour as the plant matures. Umbels. Fragrant. Sow Outside: 1/8 inch (3 mm). In warm areas only towards the end of winter or in at the start of spring. Spacing 12 to 36 inches (30 to 90 cm). Sow Inside: Soak seeds overnight. Germination time: one to three months. Temperature 70°F (21°C). Seven or eight weeks in advance. Transplant outdoors a few weeks after the last frost when temperatures do not drop below 50°F (10°C). Requirements: Full sunlight or light shade. Average soil. Provide support for larger plants. Regular deep watering. Pinch tips. In cooler areas pot pants and bring indoors over the winter. Propagate: cuttings in late spring. Miscellaneous: Though often called Red, Yellow or Wild Sage, Lantana camara is not related to sage, that is in the Lamiaceae genus. Unless you live in a warm part of the world it is best to first grow Lantana indoors first. The seeds should be imbibed in warm water for a day. Then sown at a depth of 3 mm (1/8 inch) and kept at a temperature of 21 to 24 degrees Centigrade (around 70°F). It will take from one to three months for Lantana to germinate. 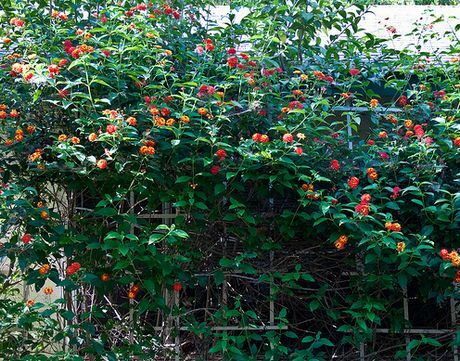 Once growing the Lantana should be transplanted into the garden at a spacing of 30 to 40 cm (12 to 16 inches) in mid-spring. They can be grown in either a sunny or a lightly shade area that has an average soil type. Once established pinch back the young Lantana to encourage bushiness. If you live in a warm climate then Lantana seeds can be sown in the garden at a depth of 3 mm (1/8th of an inch) towards the end of winter. Once growing you can propagate Lantana plants by taking cuttings; this can be done in either spring or summer. Members of the Lantana genus are easy to look after, though they require to be regularly and deeply watered in the summer months.